Escorted by a bustling flotilla of pleasure craft, the RMS Titanic - the world’s newest and largest liner - creates a majestic sight as she departs Southampton Water at the start of her fateful maiden voyage to New York, 10 April 1912. The bands played, the streamers flew and the crowds cheered; their loud ‘hurrahs’ filling the air as the world’s largest liner slipped gently away from the White Star berth at Southampton. The fateful maiden voyage to New York had begun. 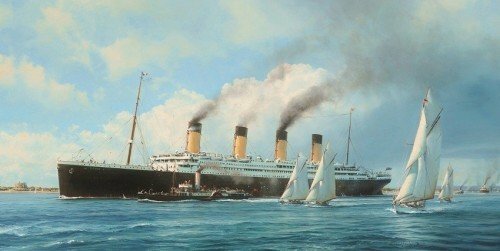 Uniquely, a small number of prints in Robert Taylor’s superb new release were personally autographed by Titanic Survivor Millvina Dean during her lifetime. In agreement with her these exclusive prints are only now released to commemorate the 100th Anniversary of this infamous event, creating a poignant and extremely desirable piece for collectors of Titanic memorabilia. Each print in this edition has been hand-signed by the artist and numbered. The Military Gallery is extremely honoured that MILLVINA DEAN – the last and youngest survivor of the Titanic – signed every print in this outstanding edition before she passed away in May 2009.